Resizing images is one of the most common things we would we when we edit a picture, image or a photo. 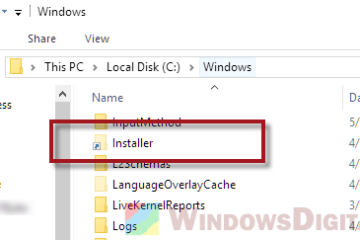 Whether you want to downsize or enlarge an image, we would usually have to use a third party software to do so in Windows OS. If you are using Windows 10 OS on your computer, you can actually resize image or photo in Windows 10 directly from Microsoft Photos app while viewing them, without the use of any third party software. 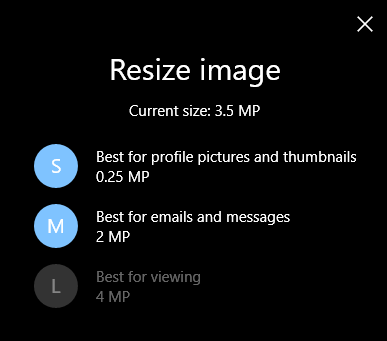 However, the sizes available for the resize in Photos app are fixed and read in MP instead of resolution. You can only downsize an image or photo in Photos app. You can’t resize an image to a size larger than its original size. So, if you’re looking to resize your photos or images to custom sizes, this may not be what you want. 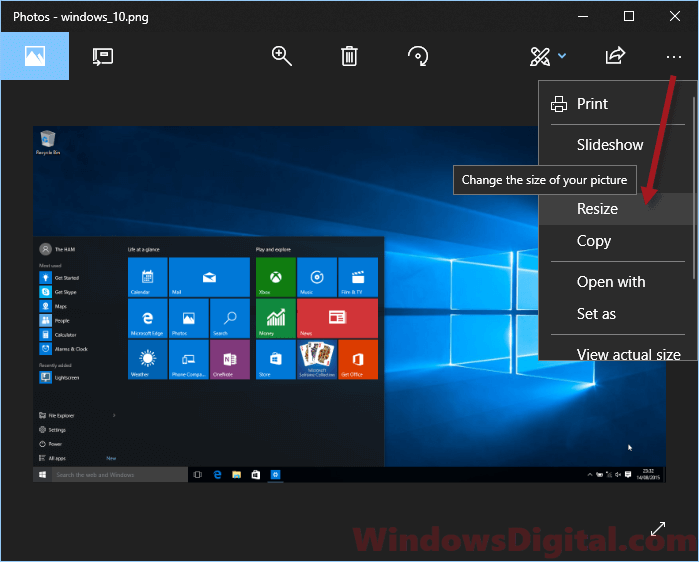 Here’s how to quickly resize an image or a photo in Windows 10 using Photos app while viewing the image. Right-click on the image or photo which you want to resize, then select Open with. Select Photos app from the list of programs to open the image. Now, click on the triple-dotted icon on the top right corner of Photos app. There are only three fixed sizes which you can choose from. Small 0.25 MP which is the standard size for thumbnails and best for profile pictures. Medium 2 MP which is the most casual looking size and best for emails and messages. Large 4 MP which is the largest size you can choose and is usually the best options for high quality viewing. The downside of this resize image or photo in Windows 10 method is obviously the sizes available for resize. Besides, you can only downsize an image but not increasing its size. 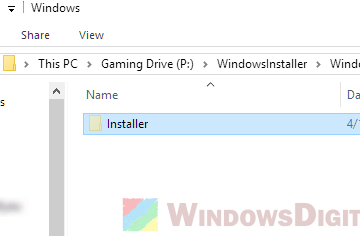 It’s certainly not the best tool to resize your image but is still convenience tool if you just want to resize some images or photos to a standard size in Windows 10 without installing any third party program. Another method to resize image or photo in Windows 10 easily is by using Paint. 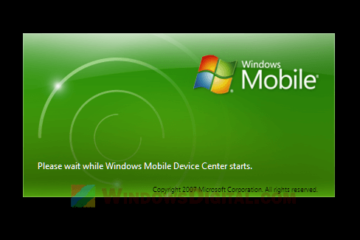 It has been the most widely used method to resize photos in Windows OS without relying on any software. 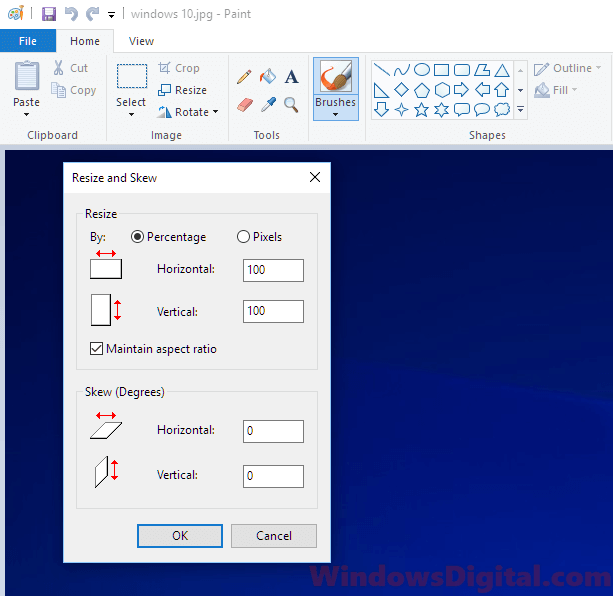 Here’s a quick guide on how to resize image in Windows 10 with Paint. Search for Paint and open it. In Paint, click File, then Open to open your desired image or photo. Under the Home tab, click on Resize. You can then enter a custom size you want to resize your image or photo to by Percentage or Pixels. A well known disadvantage of resizing your images and photos using Microsoft Paint is that the quality of the resized image will be greatly reduced. If the resize difference is big, the image or photo can even become blurry. 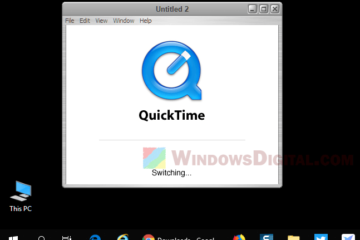 It is, however, still the best and quickest method to resize image or photo in Windows 10 without relying on any third party software. 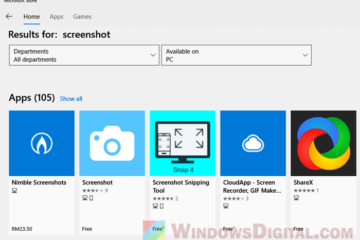 Description for sharing: A simple tutorial on how to quickly resize image or photo in Windows 10 directly from Microsoft Photos app while viewing the image or photo.